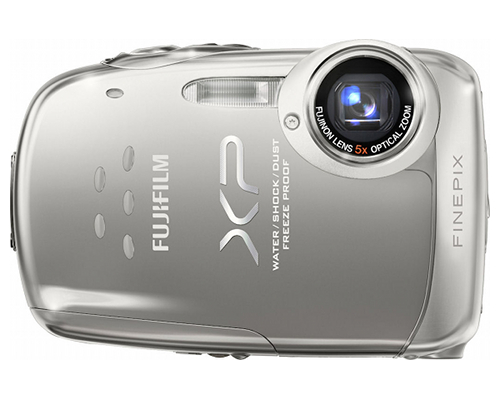 FujiFilm's FinePix XP10 is an ultracompact camera intended, more than anything else, to be durable, with water, shock, freeze and dust protection built into its design. For users who regularly break or abuse equipment, the XP10 may prove a worthwhile investment, offering protection from the elements and yourself. The camera measures 3.8" by 2.5" and .9" and weighs 4.8 ounces without accessories, the battery, or the memory card., making it relatively easy to keep in a pocket or transport. The built-in protection mechanisms will help to resist scratching and long-term damage to the camera or the display. The camera captures images at a resolution of 12.2 megapixels using a 1/2.3" CCD. It stores them in its internal memory (13MB), on an SD memory card, or on an SDHC memory card. It compresses still images in JPEG format using Exif 2.2 for compression. It captures movies using the AVI container format (containing Motion JPEG images and WAVE format sound). Images are stored at a number of possible resolutions, based on aspect ratio. The camera captures stills at 4000 by 3000 (12M), 3984 by 2656 (10M, 3:2), 4000 by 2248 (9M, 16:9), 2816 by 2112 (6M), 2048 by 1536 (3M), 1920 by 1080 (2M, 16:9), 1600 by 1200 (2M), and 640 by 480 (0.3M). It captures video at 320 by 240, 640 by 480, or in high definition at 1280 by 720. The camera has a 5x optical zoom lens with a range between F4 (wide) and F4.8 (telephoto), as well as a lens focal length between f=6.4 and 32mm, equivalent to a 35mm camera with a range of 36 and 180mm. Its digital zoom is approximately 6.3x. The camera's aperture is between F4 and F6.7 in Wide and F4.8 and F8 in Telephoto. The camera's focus distance in Normal mode is approximately 2' to infinity in Wide and approximately 3.3' to infinity in Telephoto. In Macro, the camera's range is between 3.5" and 2.6" in Wide and 3.3' and 9.8' in Telephoto. The camera's sensitivity can be set automatically or to speeds equivalent to ISO 100, 200, 400, 800, and 1600. Its focus can be set as auto focus, TTL contrast auto focus, and tracking auto focus. The camera has a programmed auto exposure mode and a digital image stabilization system, as well as many shooting modes. It can be set to presets including Natural Light, Natural Light & with Flash, Portrait, Landscape, Sport, Night, Beach, Snow, Sunset, Party, Museum, Flower, Text, Digital Image Stabilization, Auction, Successive Movie, SR AUTO (Scene Recognition Auto), Auto, Program, Night (Tripod), Portrait enhancer, and Under water. The camera's shutter speed can be set between 1/2000 and 1/4 of a second. Its self timer can be set between 2 to 10 seconds, and it also includes couple timer and group timer functions. The camera's flash has an effective range in Normal mode between 2.3' and 10.2' when shooting Wide and 2.3' and 8.9' when shooting Telephoto. When shooting Macro, it has a range between 1' and 2.6'. It has a number of flash modes, including automatic, red-eye reduction, forced flash, suppressed flash, and slow synchro. The camera has an LCD monitor 2.7" in size that offers a resolution of 230000 dots and approximately 96% coverage. The camera has a NTSC and PAL video outputs, as well as USB 2.0 high speed interface to connect to printers and cameras. The camera is waterproof up to 3m when submerged underwater, shockproof up to 1m, freezeproof up to 14 degrees Fahrenheit (-10 degrees Celsius), and dustproof. The camera has a variety of photography functions, including automatic scene recognition, face detection (with automatic red-eye reduction), framing guide, silent mode, and FinePix color. Playback includes face detection, image search, cropping, image rotation, slideshow, multi-frame playback, sorting by date, voice memo, movie edit, and mark uploading. The camera has an extremely limited battery life, producing only 100 to 125 pictures before requiring a recharge. Few accessories are available for the XP10. Fuji makes available lithium-ion batteries a battery charger, an AV cable, and an HD player that connects SD cards to other HD sources.